BATAVIA, N.Y. -- The admissions and financial aid teams at Genesee Community College have opened online registration for a SUNY Financial Aid and Saturday Visit Day scheduled for Saturday, November 17, 2018 from 9 a.m. till noon. At 9 a.m. in the Conable Technology Building of GCC's Batavia Campus, a representative from the GCC admissions team will share information on GCC's academic programs and services, detail the application and enrollment processes and be available to answer questions. With an official transcript or copy of a GED, attendees will be able to apply and get admitted on the spot! Experts will be available to assist with every step of the process between 9 a.m. and noon! Also, all morning, attendees can explore the GCC Batavia Campus using a self-guided tour. To attend any portion of the Saturday Visit Day, interested individuals should go to http://bit.ly/GCCSaturdayVisitDay and complete the simple registration form. 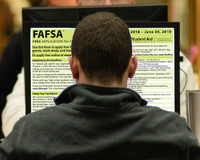 Those specifically seeking help with completing FAFSA forms should register here or visit https://www.suny.edu/attend/events, click on "SUNY Financial Aid Days" and find the Genesee Community College November 17, 2018 event to register. Visit Day walk-ins are welcome; however registration for the event guarantees a one-on-one session with a financial aid expert to help complete the FAFSA application online. Sessions will be available between 9 a.m. and 11:30 a.m. in the Conable Technology Building, Room T206. For more information, contact Nick Wockasen at nwockasen@genesee.edu or call GCC's Admissions Office at (585) 345-6800.